Fiio keeps pumping out new DAP's (Digital Audio Players) at a rate that is hard to keep up with but in my recent hunt for a new daily music player I picked up the Fiio X5 3rd gen. Having always been a symbol for good value budget audio gear we were definitely excited to get to know this DAP which on paper at least is crammed full of features aimed at directly appealing the portable audio enthusiast. Fiio has perhaps one of the most monolith designs on the DAP market. Whilst Astell & Kern build obscure shapes and Questyle and Pioneers have chunky dials popping out the Fiio x5 are a bit more traditional. Essentially it's a black rectangular block with a large touchscreen on the front. There is a nice touch of flair down the left-hand side where you find a few controls and the vertically orientated articulated volume knob. 3 colors are available for this music player (Red, Black, and Silver) we have the black one here but after seeing the Red version up close and personal that is definitely the one to go for. Build quality is excellent. I have no doubt that this player is built to last thanks to its metal body and high manufacturing tolerances. In the hand, it feels tank like, built to take the abuse of day to day use whether at home or on the go. However, you don't get that same wow factor as you do when picking up a DAP from other high-end manufacturers like Astell & Kern, Pioneer, and Sony. It feels solid but if doesn't feel special or premium if you get what I mean. The buttons have an excellent tactile feel to them and seem to be hard wearing (although longer testing would be required to verify such a statement). The volume control sits high on the left-hand side and while I would rather have this option that a digital control I just don't like that it sits in such an unnatural position for one handed operation. A top left position I think suits better and is easier to access one handed with the thumb. Additionally, it feels kind of small when I go back and forth with my AK70 unit and is a bit fiddly to reach in the pocket. Fiio has opted to place the connectors at the bottom of the DAP which makes sense because there is nothing more irritating than having cables flopping over the screen like you get with top mounted jack points. Having them bunched together in the one place also allows for simplified cable management. Another bonus for the build of the X5 is the use of brushed and textured metals as opposed to surfaces being slick and shiny. It feels more secure in the hand, gives an overall nicer feel and doesn't turn the DAP into a fingerprint magnet that you spend half your time cleaning. Lastly, on the subject build quality, I have to say that the enclosed drawers for the micro-SD cards are a great little touch. Most other audio players just opt for the spring mounted card slot but Fiio has designed its 2 card bays to operate like the Sim card tray on your smartphone. It just feels more premium and helps clean up the overall aesthetics of the player whilst at the same time reduces ingress of dirt and dust. The battery was fairly unimpressive however it is also sadly not uncommon for this sort of device. There are a lot of electronics and a rather large touch screen that has to be driven on the X5 and we found ourselves getting between 8-9 hours throughout the review. That's not great but it's not terrible. The way you use the third generation X5 will also have a big effect on battery performance. The X5 has a lot of options that can impact runtime. WIfi and Bluetooth are big drains and again if you have the screen on for extended periods you could chomp through the battery. Ok major bonus points for the screen go to Fiio. It's a big 4.0-inch number and next to most other DAP's it's glorious. DAPs, of course, don't offer the kind of resolution that you would find in today's top smartphones but then they don't need to as the predominant function is listening to them rather than looking at them. Still, the android installation does allow for apps to be used and it can be used to browse web pages in a pinch. It's pretty clear with little grain or distortion and in comparison to what we have seen from other manufacturers, it is able to keep up. We found the touchscreen to be responsive first time every time even if the OS (Operating System) was a limiting factor here. The UI is good but, and I can't believe I am saying this, I definitely still prefer the interface on the Astell & Kern AK70 than the Fiio's uglier Android styling and icons. The difference between the 3rd Gen X5 and those players is that they feel like a music device first. The X5 feels like a clunky android tablet with some audio specific hardware tagged on. It's just an android experience and you start off on an Android home screen and select the app you want to play music with. I'd rather it just was a music player from the get go. I also experienced a number of quirky glitches and crashes throughout this review. I thought maybe it's just a dodgy unit so it was returned and I grabbed another, same result. After that, upon reading online (something I never do to avoid bias during a review), I saw a whole lot of people that were frustrated. Of course, these may be issues that Fiio address in future firmware upgrades. One thing I do like is the inclusion of the Play Store, it works well and has a lot of apps that will benefit from the hardware and anyone who has used the Play store before will feel right at home operating the DAP. Placement of settings and apps is all pretty intuitive, it's an easy device to get around for anyone that has ever used an android device before but it just doesn't feel slick or special in any way. So rather than waste time talking about the other functions, let's get right into the core product. The music player app. My experience with the Fiio internal music player was pretty much all positive. There is a lot of options for playback such as shuffle repeat etc and you also get plenty of choices on how you want to browse the files. I found scanning of the SD cards to be slow though and I did notice some skipped files and incorrect artwork when trying to import but on a whole, it wasn't a bad experience. The app is really easy to get around and can definitely be considered feature rich but if you prefer to use something from a third party both Neutron and Blackplayer should be supported. Fiio killed it with the expandable memory on the X5 3rd gen. You get not one, but two card slots in which you can place micro SD cards up to 256gb each. This gives you a monstrous 512GB external capacity to go along with the 32gb internal memory. Using this memory in combination with apps like Tidal and Spotify should mean you never go hungry for something to listen to and it's certainly one of the big plus points for the player. It's official I can no longer live without apps on my DAP's. As time goes on I seldom find myself listening to physical copies of music unless it's specifically DSD files or obscure recordings. For me, Tidal is the king right now thanks to its simplicity, high resolution streaming and fairly large (although not massive) library. Tidal worked perfectly with the Fiio X5 and there is little that I need to say on the subject. It's a great inclusion with this new wifi enabled DAP's and everything works as expected and there were no compatibility issues. Spotify was a similar experience as was Blackplayer. Now other than music Apps I won't bother to comment on anything else because my LG G6 can run all other apps better than the X5. I didn't test out games, facebook, and all that other nonsense. If you are spending roughly $400 on a digital music player I expect you are going to have a pretty decent smartphone and all of these apps are going to be way better on that. The DAC inside the new X5 is AK4490. You get two for them, one for each channel. This has become the norm for these sort of players over the past year and in most cases does provide a bump in overall sound quality when implemented right. The AK4490 is an interesting choice though over the popular Sabre Dac found in most DAP's in this price range. The choice, I would suspect, has been made due to its ability to natively convert DSD as opposed to the latter's reliance on conversion to Multibit. While I still think a Burr DAC is my favorite option and I generally love me some Sabre I can see the AK4490 becoming a bit of an industry standard in portable players of the future. I should also point out that what makes a DAC sound really good is its implementation not just its physical presence so don't base purchases solely on what chip is used. 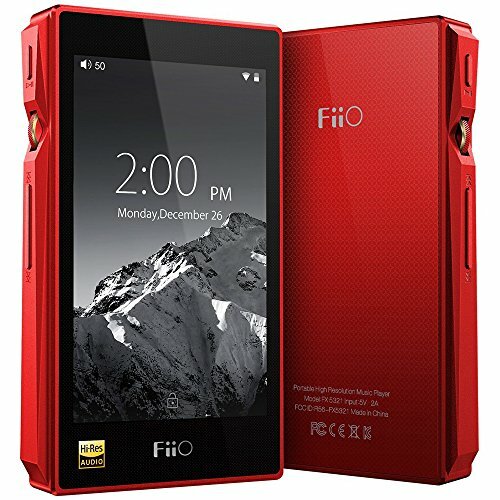 I love that Fiio chose to place all the connection points on the bottom of the screen. It means less faff with the wires when actually using the device. There are also plenty of options in terms of outputs. With more and more balanced headphones entering the market including Fiio's own newly released F5 headphones users will be happy to have this added feature. We also like the ability to use this as a transport in a rig setup and that we can use the X5 as an external DAC/Amp. You are going to have to work pretty hard to find a set of headphones that won't be driven well with the Fiio X5 3rd Gen. Its a bit of a beast and capable of driving fairly tough headphones to full capacity. The sound is without a doubt, and I am sorry to say it, the biggest letdown on what otherwise could have been a great solution for us, portable audio enthusiasts. The parts are there, the software seems just about up to snuff, but for some reason, the Fiio X5 3rd Gen just sounds distinctly average and uninspiring. This isn't just a hunch either, I spent a full month testing it out alongside the Opus #1, AK Jr, Colorly C3, AK120 and AK70, Pioneer and Sony players and I would have to place it in the bottom end of the pile sonically. Of course, the X5 is a better all around device than most, it's way more feature rich, but it also costs a lot of money. I really thought it would be a head on a challenge for the other premium DAP's listed above but song after song I was consistently left wanting more. I went through my headphone and IEM arsenal (Campfire Jupiter, Vega, Andromeda / UERM / HD650, HD800s, FAD Sonorous VI) trying to find a good match but in the end, it just sounded a bit more dead than my other DAP's. I was disappointed, to say the least. The fact that I use the Quad band DAC enabled LG G6 as my phone and to my ears, it sounded superior to a multi hundred dollar dedicated device, really made me question why I would own such a unit. That said most smartphones do not sound like the G6 and for some people, the X5 Mark III may still be a significant step up to what they have, especially when using DSD. Compared to the competition it technically doesn't do anything wrong but it doesn't sound as open and spacious next to an AK70 or Opus and I also feel you lose out a touch on the energy. The X5 just sounds a little too dead for me to really like it. I think, like me, a lot of people had anticipated the Fiio X5 3rd to be something special. We wanted a giant killer that would make use question why we needed to buy anything more expensive. What we got, in the end, was something that sits in the distinctly mid-fi category and thus also appears expensive for what you actually get. It still has a lot going for it in terms of features and build-quality though. We were fans of the design and intent but just not as impressed by the execution. There is nothing inherently wrong with the X5 Mark iii all the functions work and the sound is not bad per say, but we are living in an extremely competitive time for the HD Music Player. You have lots of choice from Oppo, Onkyo, Cayin, Pioneer, Sony, AK and more. In this space, just good doesn't quite seem good enough. Excellent is becoming a new normal. I think it's clear to see that I wanted to like this DAP so much. Enough that I actually bought it. However, as I sit here finishing off the Fiio X5 review, I have to admit that I have already sold it and moved on to the AK70 from Astell&Kern. I still have high hopes for the new X7 but for now, the quest for the perfect HD music player continues.